Size: 3.9" x 2.3" x 0.35"
This Toshiba LC-829 calculator is one of the products that is somehow a misfit in the product line: Smaller than e.g. the LC-830 or LC-842 and manufactured in Hong Kong instead Japan. Dismantling the LC-829 reveals a big surprise - the single-chip calculator circuit located in the featured model was manufactured by competitor Sharp Electronics! 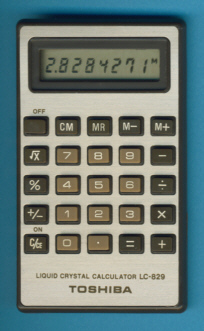 Don't miss the Toshiba LC-857 calculator, another "mystery" product. © Joerg Woerner, January 4, 2011. No reprints without written permission.